WHEN a man buys an investment or capital-asset, he purchases the right to the series of prospective returns, which he expects to obtain from selling its output, after deducting the running expenses of obtaining that output, during the life of the asset. This series of annuities Q1, Q2, … Qn it is convenient to call the prospective yield of the investment. Over against the prospective yield of the investment we have the supply price of the capital-asset, meaning by this, not the market-price at which an asset of the type in question can actually be purchased in the market, but the price which would just induce a manufacturer newly to produce an additional unit of such assets, i.e. what is sometimes called its replacement cost. The relation between the prospective yield of a capital-asset and its supply price or replacement cost, i.e. the relation between the prospective yield of one more unit of that type of capital and the cost of producing that unit, furnishes us with the marginal efficiency of capital of that type. More precisely, I define the marginal efficiency of capital as being equal to that rate of discount which would make the present value of the series of annuities given by the returns expected from the capital-asset during its life just equal to its supply price. This gives us the marginal efficiencies of particular types of capital-assets. The greatest of these marginal efficiencies can then be regarded as the marginal efficiency of capital in general. Furthermore, it seems unlikely that the influence of banking policy on the rate of interest will be sufficient by itself to determine an optimum rate of investment. I conceive, therefore, that a somewhat comprehensive socialisation of investment will prove the only means of securing an approximation to full employment; though this need not exclude all manner of compromises and of devices by which public authority will co-operate with private initiative. But beyond this no obvious case is made out for a system of State Socialism which would embrace most of the economic life of the community. It is not the ownership of the instruments of production which it is important for the State to assume. If the State is able to determine the aggregate amount of resources devoted to augmenting the instruments and the basic rate of reward to those who own them, it will have accomplished all that is necessary. Moreover, the necessary measures of socialisation can be introduced gradually and without a break in the general traditions of society. This is a refutation of the idea of loanable funds. Banks do not act as intermediaries, Wicksell indirectly writes, but ‘no matter what amount of money may be demanded from the banks, that is the amount which they are in a position to lend…’. 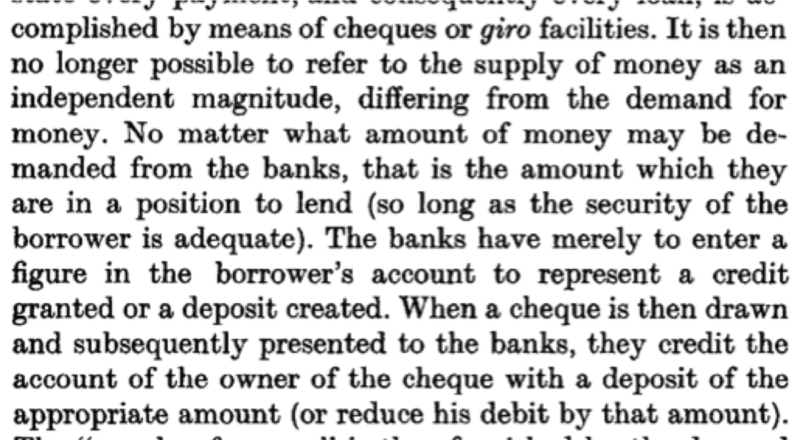 Banks ‘have merely to enter a figure in the borrower’s account to represent a credit granted or a deposit created’. So, banks do not collect savings from those that have too much money in order to lend those loanable funds to those that need money. Knut Wicksell deserves to be lifted from obscurity. The crisis of economics is the crisis of non-Wicksellian economics. 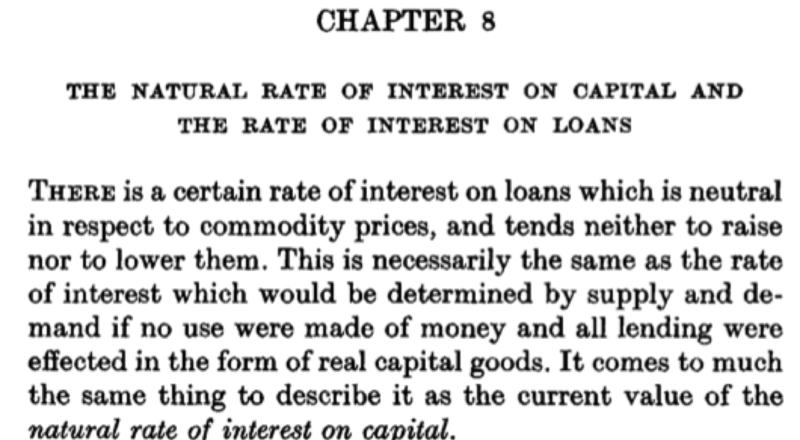 In Wicksell, as in Keynes, we look at a monetary circuit and inter-temporal problems. In non-Wicksellian economics, we are always in inter-temporal equilibrium and hence there are no financial crisis, no defaults and not even assets or liabilities nor are banks modelled. « Modern Money Theory and Post-Keynesian economics – time for reunification?